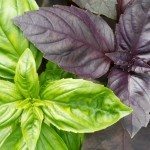 Is it true that you should cut back your basil plant (grown inside) so that it will not get bitter? You should do that with any basil plant. Cutting it back regularly will keep it from bolting (flowering). Once it bolts, it starts to become bitter.